Unless you’ve been leaving behind a large rock, you’ll have noticed that there’s a resurgence in excellent gin brands coming out of Scotland. Edinburgh Gin has been at the forefront of this. It’s in the middle of a mini heat wave that I arrive in Edinburgh, ahead of the launch of the distillery’s new expression, 1670, which has been a 12 month collaboration between head distiller David Wilkinson and the Royal Botanic Garden Edinburgh, and its botanist, Dr Greg Kenicer. It’s perhaps apt that the launch is taking place during this rare-tropical heat, as among the botanicals in this new expression is Tasmanian Lanceolate Leaf and Tasmanian Mountain Pepper, presumably more acclimatised to these sorts of temperatures. Since being founded in 2010, Edinburgh Gin has been not-so quietly building up a reputation for quality, innovative products. The distillery prides itself on marrying together art and science, which is a philosophy its staff clearly embody. Wilkinson is a graduate of Heriot-Watt’s MSc, in Brewing and Distilling, while distillery manager is Finlay Nicol, formerly a professional chef. Together they are supported by fellow graduates of Heriot-Watt, Ruairidh Kemmett and Andy Colman. The brand’s core range includes its flagship Edinburgh Gin (43% ABV), with botanicals such as milk thistle and heather. Secondly, Seaside Gin, (43% ABV), which was produced in collaboration with Heriot-Watt and its botanicals include ground ivy, bladderwrack and scurvygrass. Cannonball Gin is its navy-strength offering (57.2% ABV) and packs a serious punch, with Szechuan peppercorns adding some heft. Wilkinson, a confessed whisky fan, admits it’s popular with drinkers from that parish. Seasonal offerings include Christmas Gin and Valentine’s Gin. However, you’re just as likely to have come across the brand through its range of gin liqueurs. These include Pomegranate & Rose, Raspberry, Elderflower, Rhubarb & Ginger and Plum & Vanilla. Each comes to life in a fizz-style drink, however they all deserve to be sipped neat too. In many ways, Edinburgh Gin tells the story of the recent boom. Each of its core range is a careful balance between innovation and tradition; even answering the growing calls for provenance. The flagship Edinburgh Gin is a classic London Dry, but with a welcome Scottish twist and by going to Heriot-Watt on the Seaside Gin, Wilkinson went back to his own upbringing. ‘I went back to mentor some of the students and we developed this in the labs. We went on a nature walk in East Lothian with a local forager and she found us things that were safe to use, that she thought would have interesting flavours. We then chose three to use in the gin. Likewise, its distillery tours (only at the Rutland Square site) are becoming a staple part of trips to Edinburgh, involving masterclasses, G&Ts and even the chance to make your own gin. Just the day before I arrive, a range of ready-to-drink cans was launched to supermarkets. The new release 1670 (43% ABV) also combines innovation and tradition. 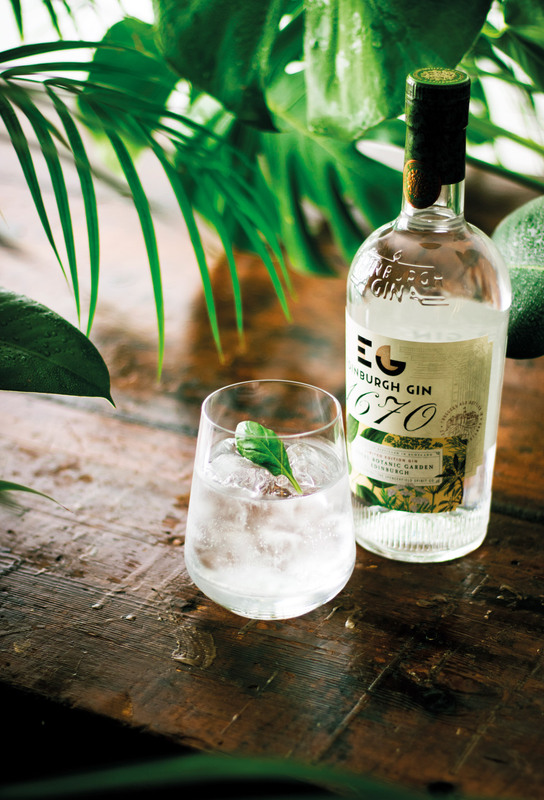 Edinburgh Gin looked locally to the Royal Botanic Garden Edinburgh, for inspiration on the botanicals, while the name is a nod to the year the gardens were founded, nearly 350 years ago. A savoury gin that goes well in a G&T garnished with basil, it’s a mix of 14 native and exotic plants each chosen by Wilkinson and Dr Greg Kenicer, taking in elements from the garden’s origins as a medicinal physic garden in 1670s to its research and conservation work today. We can only look forward to what future experiments and inspiration Wilkinson and the team might find in the heart of Edinburgh. Got a bottle of Edinburgh Gin 1670? – Find a suggested serve here.